Complete College America (CCA) is the most comprehensive and ambitious higher education initiative ever undertaken by the state of Oklahoma. The goal is to increase the number of degrees and certificates earned in Oklahoma by 67 percent by 2023 to meet our state's workforce needs and keep Oklahoma competitive in a global economy. Gov. Mary Fallin is a strong advocate for the initiative, saying at the kickoff press conference in September 2011, "We can and must do better in producing a highly skilled and educated workforce in our state. This is part of our agenda – developing the Complete College America program." 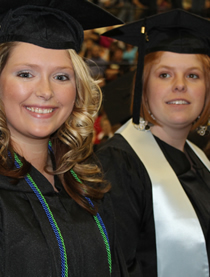 Oklahoma's five-point plan to increase degree and certificate completion has led CCA to name Oklahoma the national model for degree completion. Our state plan focuses on promoting college readiness, transforming remediation, strengthening pathways to certificates and degrees, expanding adult degree completion efforts, and rewarding performance and completion. Significant progress is being made toward these goals. In the first four years of the CCA initiative, the number of degrees and certificates earned in Oklahoma has increased by 8,462, surpassing the state benchmark of 6,800. While we have made substantial gains and exceeded these early benchmarks, we acknowledge the growing challenges we face in maintaining this significant momentum. Other CCA states have increased their investment in degree completion initiatives, while Oklahoma has repeatedly surpassed our goals on either flat or reduced budgets. At the national level, five foundations are providing multiyear support to Complete College America: the Carnegie Corporation of New York, the Bill and Melinda Gates Foundation, the Ford Foundation, the W.K. Kellogg Foundation and Lumina Foundation for Education.